It’s that time of year when jaunty skeletons and grinning ghosts walk the streets of Richmond in search of a bone-tingling good time. And luckily the city has a brimming cauldron of cool 2018 Halloween happenings that would cheer-up even the grouchiest of witches. Now is the time to make plans for some October fun! Head straight to Richmond Country Farms this October for their charming Pumpkin Patch extravaganza, an almost 40-year-old autumnal tradition. You’ll find farm animals, wagon rides, live music, and friendly characters (we love Polly Pumpkin) to keep you and the kids fully entertained. Tickets holders receive a pumpkin plus a free Spartan apple. Make sure you also save time to visit the onsite winery and produce market! Head to the Nature House at one of Richmond’s favourite outdoor attractions and you’ll find family-friendly displays and enlightening info on the natural origins and foundations of Halloween. If it’s one of those fine blue-skied autumn days, save time to explore the park’s inviting trail system and snap a few shots of the fall-hued trees in all their glory. Want to give your kids a challenge? Get them to keep an eye out for wildlife such as birds and squirrels. One of Richmond’s most evocative historic attractions, you can tread the Britannia Shipyards’ creaking boardwalks and enter its storied wooden buildings on this one-night-only Halloween-themed special tour. 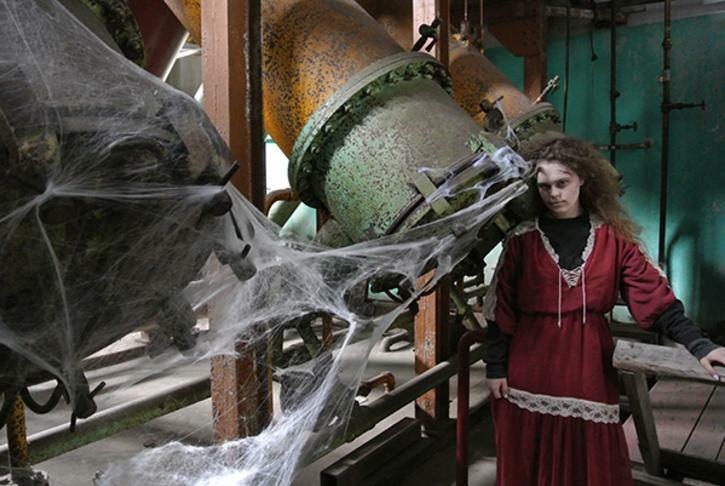 Plunging you into the murky realms of yesteryear, you’ll soon be asking yourself if this historic complex is haunted. Only time (and your tour guide) will tell. Book early for this adults-only evening event at 604-238-8050 (barcode #2606242). If your costumed kids love the idea of showing off their outfits on ice, consider Minoru Arenas’ themed evening of spooky lighting and Halloween music. Alternatively, drop into the Richmond Olympic Oval on October 28 (3:30pm – 5:00pm), where your special ghoul-friendly skate will include a haunted house and frighteningly good treats (standard fees and skate rental prices apply). On the same day, the Oval’s Olympic Experience Museum will also be hosting Halloween challenges for all the family. The popular Buck & Ear Pub in Steveston is the place to be on October 24 when it hosts both a Pumpkin Carving Contest (7:00pm; tools and pumpkins provided) and a free-to-play Trivia Night quiz themed on horror movies (8:00pm). Dress up and drop by again on October 27 (from 9:00pm; admission $10) and you’ll find a spooky Halloween Party. Need to sober up the next day? 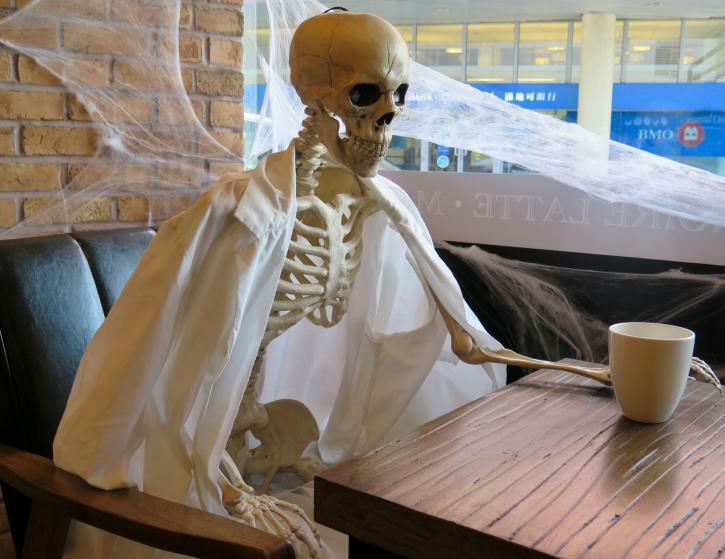 Richmond’s Noire Cafe is already fully decorated for Halloween and their perfectly-prepared coffee might help perk you up. Just a stone’s throw from Britannia Brewing in Steveston, one of Richmond’s hottest Halloween parties will be serving up a DJ-driven dance floor, casino tables, tasty food truck dining, and plenty of glasses of the brewery’s new Blueberry Sour beer (plus other libations). Costumes are mandatory (the best-dressed wins a keg!) and tickets include three drinks plus food. Book ahead here since tickets are strictly limited. Drop in for this new, all-ages Halloween event at the Gulf of Georgia Cannery National Historic Site, which includes a creepy cornucopia of sea monsters, aquatic ghosts, and a tentacled array of seafaring stories and watery legends. Games, crafts, and haunting activities add to the fun and guests are invited to arrive in their costumes—which is, after all, the best way to get into the ‘spirit’ of any great Halloween event. An eerily entertaining event for the whole family, drop in for this delightful evening and you’ll soon be following a trail of candlelit pumpkins in Richmond Nature Park. The evening includes spine-tingling storytelling and a Bog BOOgie family dance, making it the perfect way to have fun while grinning like a jack-o-lantern. Parking is limited, so be sure to hopping on the Pumpkin Express Shuttle from Cambie Secondary School or Richmond City Hall for a fun ride to the event. Bring your costumed kids to the Britannia Shipyards on October 27 (1:00pm – 4:00pm; admission free) and they can wander around with you and Trick or Treat on Britannia’s Boardwalk. If they’re hungry for more, bring them back to Steveston on October 31 (3:00pm – 5:00pm), when merchants around the village will be handing out candies during their annual family-friendly Halloween Trick-or-Treating event—stop by our Tourism Richmond Visitor Centre on Moncton Street first and pick up a free map of participating businesses. Richmond’s biggest Halloween fireworks event isn’t just about craning your neck at that sparkling fireworks cascading over the park—although that’s certainly the evening’s breathtaking finale. Bring the family early and you’ll also find live music, roving performers, a children’s parade, and even fire jugglers in an extravaganza guaranteed to make any passing zombies forget their troubles and enjoy themselves. There are also smaller free fireworks displays on the same night at McLean Neighbourhood Park, West Richmond Community Centre, and South Arm Community Centre, all starting at 8:15pm.